A classic restaurant favorite gets a grain-free makeover! 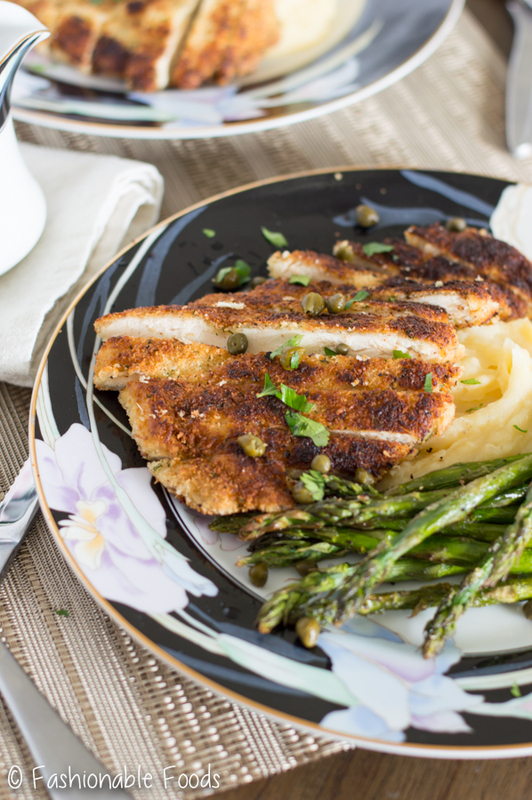 This Whole30 chicken piccata is the perfect meal whether you’re eating grain-free or not. It would make a fantastic Valentine’s Day meal! 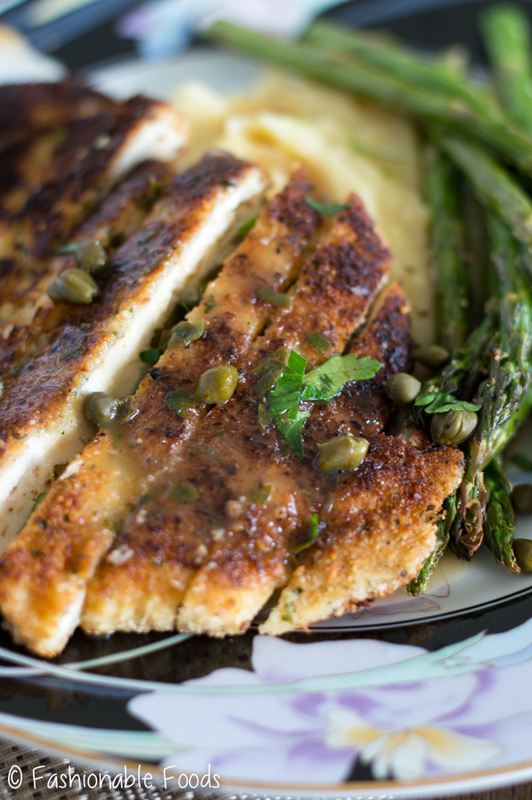 Chicken piccata has always been a favorite of mine. 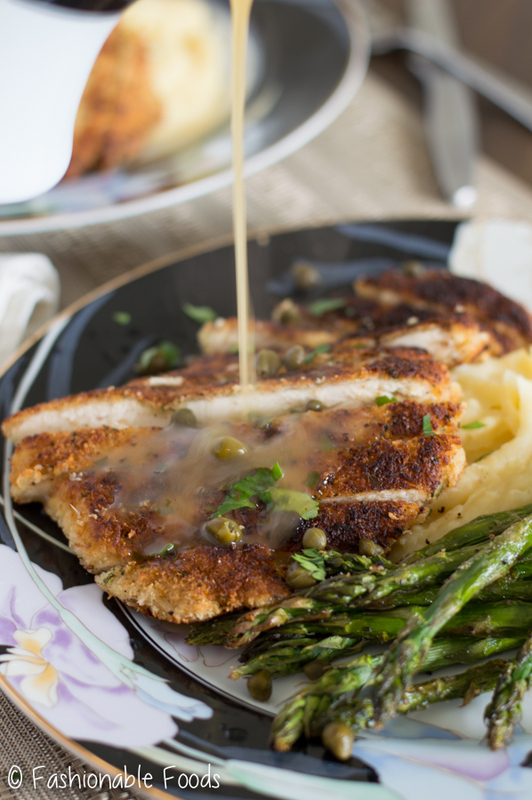 Crispy chicken cutlets in a tangy lemon sauce… that’s basically my love language. 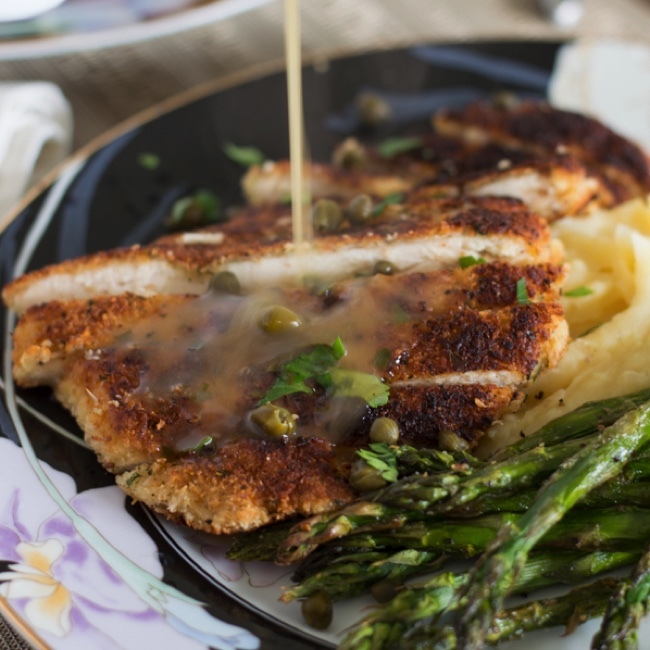 Classic chicken piccata is usually flour-dredged chicken browned up and served with a buttery, lemony wine sauce. 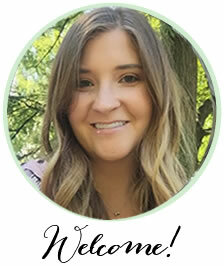 I decided to make a Whole30 version and I’ve gotta say, I like it better than the original! 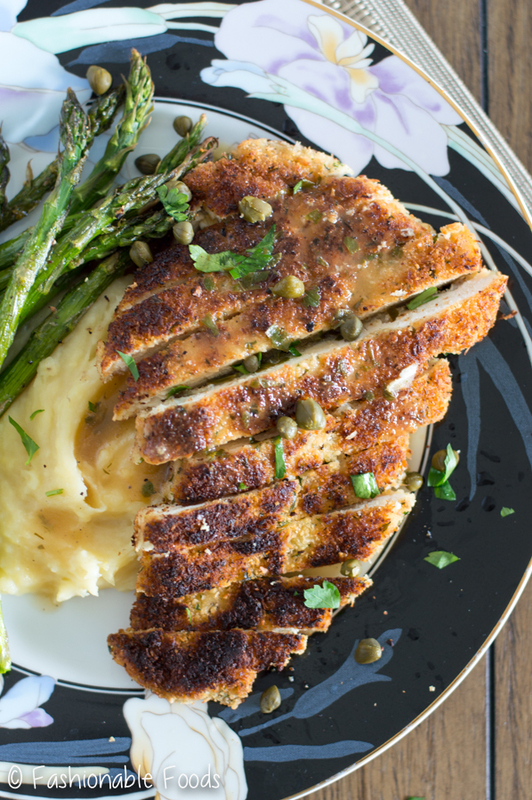 This Whole30 chicken piccata would make the perfect Valentine’s Day meal whether you’re doing Whole30 or not. Trust me on this one, if you love delicious food, you’re going to love this recipe. 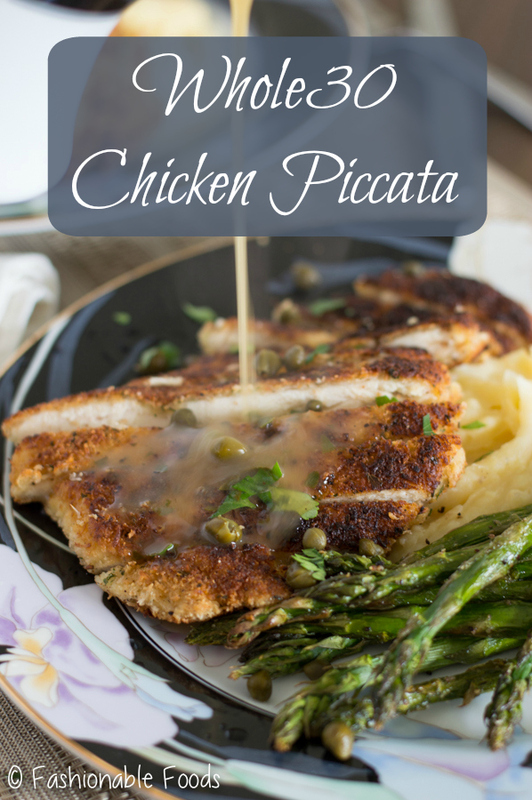 There are many reasons why I love this chicken piccata recipe over the classic. Crispy chicken. Because we bread the cutlets in almond flour and unsweetened coconut we get a nice crispy cutlet. Much better than just dredging in flour. The sauce. That lemony sauce is the bomb. No wine or butter needed! Chicken stock works in place of the wine and a touch of ghee adds rich flavor. It’s a crowd-pleaser. Who doesn’t love crispy chicken covered in a tangy sauce? Make-ahead: dredge the chicken ahead of time and lay them on a plate in a single layer. Refrigerate until you’re ready to cook them. You can make the sauce ahead, too. Just reheat on the stove or in the microwave. Keep a close watch on the chicken while you’re frying it. Because we’re using almond flour and coconut, the coating can burn very quickly. Cooking on medium heat and keeping a close eye on it is recommended! If doing Whole30, mashed potatoes are a great side. They are the perfect vessel for that tasty sauce. 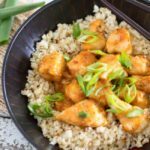 However, if you aren’t doing a Whole30 or eating Paleo/grain-free, this would also pair perfectly with rice, quinoa, or couscous (if you’re not gluten-free). I have yet to find gluten-free couscous. This would make a great special occasion meal… say, for Valentine’s Day. ? I highly recommend you make this for your Valentine. And, if you’re not doing Whole30, you should make this for dessert. A healthy meal first makes dessert a bit more acceptable, right? It is Valentine’s Day after all. I could go on and on, but how much more I can say? I’d say Whole30 chicken piccata speaks for itself! In 3 shallow dishes, place the tapioca starch in one, the beaten egg in another, and the coconut and almond flour in another. Season each generously with salt and pepper. Add the parsley and garlic powder to the coconut/almond flour mixture and stir. Bread the chicken cutlets by first dredging in the tapioca starch, then coating in the egg, and then finishing with the coconut/almond flour mixture. Once all the chicken is breaded, heat a large skillet over medium/high heat and add enough oil to coat the bottom. Brown the chicken 3-4 minutes per side, or until deeply golden. Transfer to the warm oven while you make the sauce. Wipe out the skillet (or use a different pan or pot) and add in the chicken broth and lemon juice. Bring to a boil for 1 minute. In a small bowl, combine the ghee with the tapioca starch and mix until all of the tapioca is combined into the ghee. This is called a beurre manié (though it normally uses butter and flour) and is amazing for thickening pan sauces! Whisk the beurre manié into the sauce and it will thicken quickly. The sauce won’t be super thick, but feel free to do this method again if you prefer a thicker sauce. Stir in the capers and parsley and season the sauce with salt and pepper to taste. 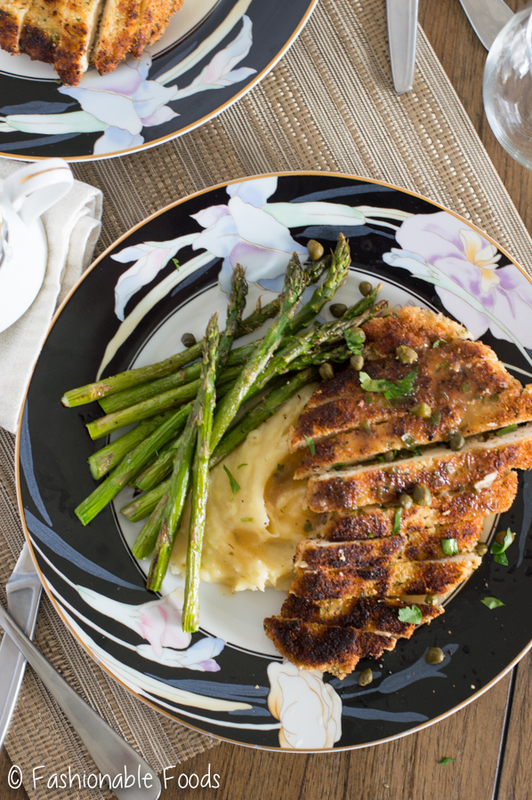 Serve the chicken with sauce alongside mashed potatoes and roasted asparagus for a delicious meal! 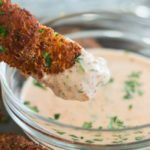 *If you're not into grain-free, you can simply use gluten-free flour and breadcrumbs (or regular for non gf) in place of the tapioca, coconut and almond flour! *Room temperature butter can be used in place of ghee if not doing Whole30/Paleo. Dredge the chicken ahead of time and lay them on a plate in a single layer. Refrigerate until you're ready to cook them. You can make the sauce ahead, too. Just reheat on the stove or in the microwave. Keep a close watch on the chicken while you're frying it. Because we're using almond flour and coconut, the coating can burn very quickly. Cooking on medium heat and keeping a close eye on it is recommended! I love chicken recipes with lemon and this version looks so flavorful and delicious. A perfect meal for any occasion! Andre Casey recently posted…Are Green Powders for Green Drinks the new trend?